With the strengthening monsoon flows across Arabian sea, the monsoon conditions have upped its ante over Konkan, Goa & Madhya Maharashtra and is expected to widen its tentacles and spread its wings across entire West coast from South Gujarat to Kerala coast over the weekend. These revived conditions in conjunction with twin upper air circulations over Bangladesh and Odisha respectively are expected to enhance heavy rainfall activity over East India and adjoining central and peninsular India over the next 4-5 days. Meanwhile, Isolated Thunderstorms are expected over North Interior TN. 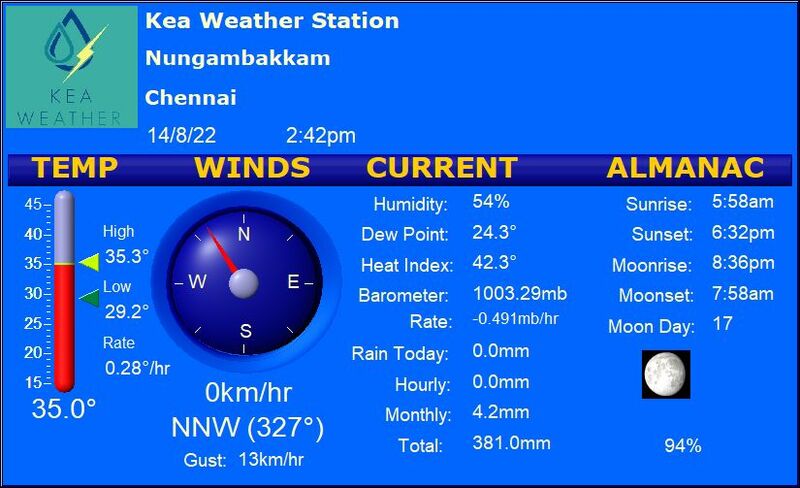 Chennai – A Warm and Humid day leading to a manageable night with a high of about 37 degrees and a low of 27 degrees. Coimbatore – A Partly cloudy day followed by drizzles and breezy conditions by night. High of about 31 degrees and a low of 22 degrees. Madurai – Mostly Sunny and Hot during the day with some passing clouds by evening. Max of about 38 degrees and a low of 27 degrees. Trichy – A Clear and Hot day leading to a high of about 38 degrees and a low of 26 degrees. Vellore – A Bright and warm day leading to a pleasant night. Max of about 37 degrees and a low of 24 degrees.